Our vote is yes! 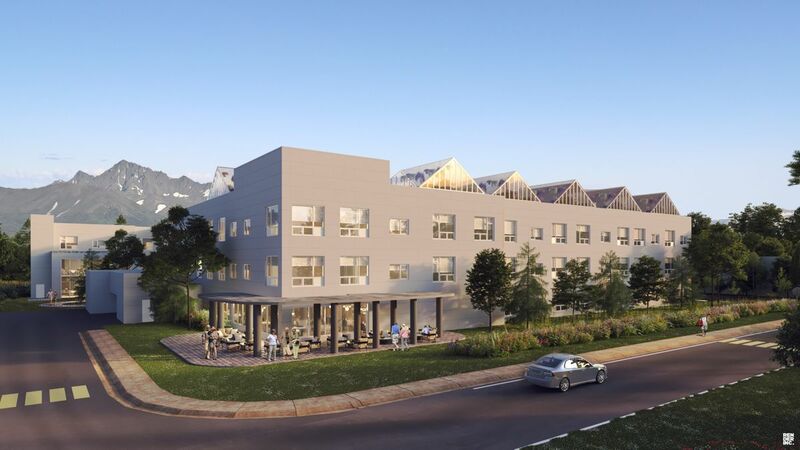 The Baxter Senior Living facility will be designed to allow installation of a rooftop greenhouse, according to a recent Daily News article. This is exciting! While food self-reliance is a major benefit, there are at least two other reasons why this type of development is a good thing for Anchorage. First, garden roofs potentially result in cost savings in several ways. According to a study by the National Research Council of Canada, normal roof temperatures can exceed 150 degrees on hot days. As the roof heats, air conditioning kicks in to maintain interior comfort level. In cold weather, interior heat seeps out the roof. These extreme hot and cold temperatures cause the roof membrane to dramatically expand and contract, which decreases roof lifespan. A garden roof helps to maintain a more even temperature inside the building by shading during hot days and insulating during cold days. Eliminating temperature extremes reduces energy needs, allows mechanical equipment to work less, and increases a roof's lifespan. All of this saves money. When spread out over the "asphalt jungle" of a city, it helps to reduce urban heat island effect created by the solar gain amplified from man-made materials like asphalt and concrete. Additional benefits are a natural filtration of rain run-off as garden roofs slow water movement. Based on a New York Metropolitan Region research report, a garden roof retains over 74 percent of rainfall. A standard roof retains only about 25 percent of rainfall, and the resulting run off allows much more water to flood streets and inundate drainage systems. This extra water weight is why a garden roof needs additional engineering and structural reinforcement. Next, rooftop gardens and greenhouses have definite health benefits for participants. The AARP offers five primary benefits. 1. Outdoor activity helps increase Vitamin D levels, which benefits bones and the immune system. 2. According to a 2006 Dubbo Study of the Elderly, gardening might also help to lower the onset of dementia by 36 percent. 3. A study in the Netherlands found gardening helped test subjects lower the cortisol (stress hormone) levels in their blood and positively enhanced their mood. 4. Gardening is a great aerobic exercise that helps with stamina, strength and flexibility. 5. Gardening helps to foster a sense of community and accomplishment. Everyone can contribute, no matter what their physical level. Harvesting the nutritional results is a wonderful reward and provides an incentive to continue. If you doubt the benefits, try wandering through Bell's Nursery during the winter and see how you feel. Did you notice others lingering with their coffee or strolling through the plants? You might not have even realized why you went. So let's all get excited about the benefits and adapt new building regulations to improve Anchorage's livability and provide green spaces in our urban jungle. Who knows, as the process and designs develop, roof gardens may even become more prevalent on residential homes.